Hyderabad But I'm not getting speed as shown, after wire cut i'm only getting good speed on idm only sometimes. is it copper or fiber optical ? But on 4mb for me the normal vids also dont play good. They always stream. So how can a 720p video gonna work without bufferring? 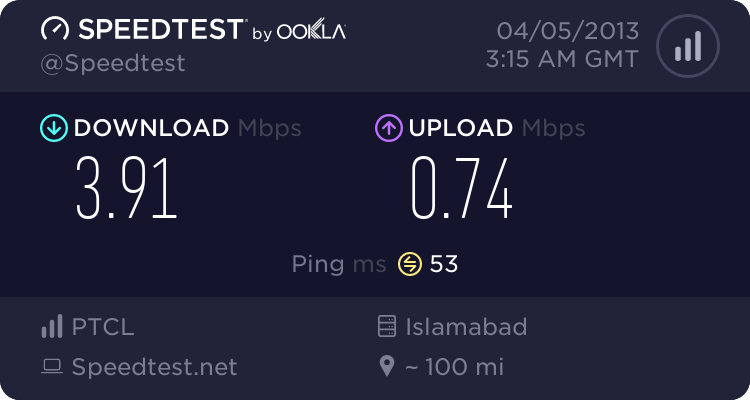 Actually, its not necessarily the line quality - its how much PTCL is willing to dispense out in bandwidth from your exchange end. That's why performance varies from exchange to exchange, and locality to locality. For instance, PTCL in Bahria Town Rawalpindi is miles better than in the Gulrez area. And I know cause I've used them in both places. Speed tests done on a foreign server are a bit more accurate than local speed tests. Try performing one on testmy.net and see there what you get. That’s why performance varies from exchange to exchange, and locality to locality. For instance, PTCL in Bahria Town Rawalpindi is miles better than in the Gulrez area. And I know cause I’ve used them in both places. is it good for 4mb or not? Not really. That's more like 2 mb speed. I'm in Lahore, and for 1mb, i get 105kb/s download - which is decent. Back in pindi, I barely cross 35kb/s on ptcl. So it depends on the area you're in. You should always try multiple locations for speed tests for an idea - some streams may not always function properly. You can also try ovh.net (which uses the Speed test software). 4mbps, Faisal Town, Lahore exchange. PTCL uses Fokker engines with their BB service. You know its Jet age. Fokker engines exhaust on long distance. strange dissconections since yesterday on nitro in rwp region or all over any one else .